If you have ever had the privilege to drive a vehicle that has electronic air suspension such as, Land Rovers, Range Rovers, Jaguars, Lr3, and Sports you would understand why a car designer would add this luxury to a high end brand. 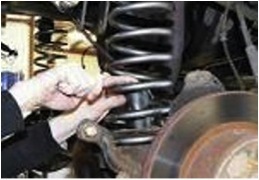 Most cars are held up by metal coil springs as shown in this picture. The concept of replacing this spring with a bellow that inflates with air was brought about with the intention of a much smoother ride. Makes sense to me. Being supported by an air strut seems a lot less ridged than a metal spring. There are several different types of air suspension systems, but to keep it simpler we will look at a 2004 Range Rover. The basic components of this systems include the Air Suspension pump (blows air into a reservoir) the air struts on each wheel, a valve body to distribute air to the bags (struts), a computer to control all this, and sensors on each wheel to communicate the height back to the computer (ecu). On this particular vehicle all these components could add up to over $6k dollars to replace. Because of this many people inquire about getting rid of this type of suspension and converting it over to a coil type set up. The thought is that once it is converted there will be no more expense. That is great, it is, however, FALSE. Road Britannia has done several conversions and thousands of air suspension repairs so we can tell you what works and what doesn’t. Unless you have a p38 Range Rover, a rear suspension on a Discovery II, my advice is to not convert the suspension. The main reason is cost. The price of the kit and the labor for install is around 3k. The ride is not the same. Of course the option of ride heights are now inactive. The theory of never needing to mess with it again is wrong because the conversion requires the use of some of the old air strut pieces. These pieces can break in time. 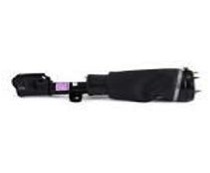 The repair for this requires a new or used air strut and then remounting the coil spring onto the part. Several hundred dollars later, you can be on your way. The third reason I don’t like this is that not all the air suspension components will likely fail. Normally the front struts start leaking and need replacement by 80k miles and the pump will also fail around the same time, sometimes a bit longer. The rear bags rarely fail. We do see some height sensors and the occasional ecu (usually fried out because a repair shop went poking and prodding it). All in all, the ride quality will diminish greatly with the coil conversion to the point I can’t in good conscience recommend it on that basis alone. I have customers who insisted on this conversion even after explaining this. 75% of them later regret it. Just wanted to share! This entry was posted on Monday, June 9th, 2014 at 8:20 pm	and is filed under Helpful Tips. You can follow any responses to this entry through the RSS 2.0 feed. You can leave a response, or trackback from your own site.